If at first you don’t succeed try, try again…Say it again….if at first you don’t succeed try, try again. These are the words of encouragement I am currently giving myself. I LOVE LOVE LOVE the idea of having an unnatural hair color…something like pink, blue or green. So when Bumble and Bumble launched their line of hair chalk I was all in!!! So last week I decided to go for a blue streak for Sunday brunch…let’s just say as I was enjoying a giant sweet potato pancake when it came to my attention that the blue in my hair somehow made its way to my face…no big deal, I was going for a Smurfette look! 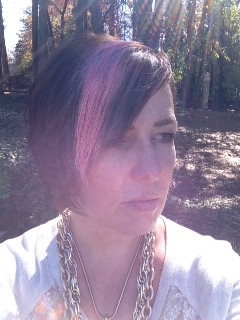 No fear here…today I jumped in again with better( but not great) success with a pink streak. Let’ see what happens next week!